Gundren Rockseeker, eldest of the three Rockseeker brothers, is a smith and caravan leader by trade. Unlike most dwarves which are reclusive, Gundren has friends and allies among most of the good races of the world. After a series of events in which one of his brothers was killed, Gundren's heroes managed to reclaim Wave Echo Cave. 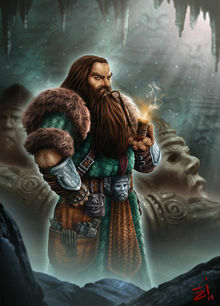 Now he acts as diplomat between the human and dwarven workers of Wave Echo Cave, and plans to renew the ancient Phandelver Pact which will once again turn Wave Echo Cave into the most prosperous mine of the North. He has made a deal with Ironbeard to return Phrex back to his living self in exchange for researching a book found in Wave Echo Cave. In addition, Ironbeard is the sole remaining member of the group that freed the mine from its inhabitants and therefore the only person beside Gundren who has a stake in it.